I have just published a new article by Cervantes [pen name] on my main website. A Sorrowful Knight Errant in the Land of "Education"
I'm not denying the fact that all of us have a right to our own beliefs in things. As I'm sure you know, some people believe that Oswald killed Kennedy, Tippit, shot at Walker, beat his wife, defected to Russia and returned with no inside help, and was just an out and out loser looking for glory. Then, you have those that think that Oswald was a low-level intelligence asset who was trained to speak Russian, "defected" as a counter agent, came back with inside help, was made to look like a Castro sympathizer when he passed out leaflets in New Orleans, and was put into place to take the fall for Kennedy's murder. And, then of course you have everything in between - the limo driver shot Kennedy, the shots came from the sewer manhole, the Z film was faked, the Z film was *not* faked, Kennedy's body was squirreled away from the plane at Andrews and altered, and on and on and on. I've been researching, studying, and learning as much as I've been able to about Kennedy's murder since 1975. My beliefs are, in essence, that he was murdered due to a conspiracy, that Oswald was a patsy (as he said and was captured on film saying), and then was murdered so he wouldn't reveal the conspiracy. Then, it was just a matter of the government stifling all vigorous pursuit of what really happened. And it's continued now for 53 years. Those are my beliefs, just like John McAdams has his beliefs about the lone nut theory. I don't know Pat Speer personally and I don't know you personally. I've read Pat's website several times and I think the work he put into it is admirable. Is it perfect? Of course not, just like the video I made several years ago has some things in it that is probably not correct. And just like the work you do, and Mantik, and Groden, and others. I come to this forum to try to learn as much as I can and then ponder what I've read and weigh the pros and cons and go from there. For example, when I heard about this Prayer Man thing, I was skeptical about it, like I'm skeptical about Oliver being the Babushka Lady, or that Nagell had anything to do with the murder, or the Z film being fake. PM at first sounded like another one of those far out "Jackie shot JFK" theories. But I've actually come around about PM now, especially after seeing the work that was put into trying to track every TSBD employee and the enhanced photos showing what certainly looks like LHO standing in the doorway as Baker is running to enter it, and then all of the fudged statements about running into him in the break room. But anyway I'm just trying to figure out why you would paste a link to your article on this forum, and where the article is designed as a conversation and instead of using real names, you use literary characters? I'm not sure what the larger point is and how it serves this site as being an education forum. Science stands on its own merit irrespective of authorship, literary devices employed to express it, and the like. Let's stay on topic by discussing the evidence presented. Fine. Remove all the distractions from this photo. And then compare it to the internal aspect of the Harper fragment. Once you do so, it will become obvious that the Harper fragment is not the middle of the occipital bone, as claimed by Mantik. (If one starts by looking at the ridge at the middle of the bottom of the photo, and then follows this ridge up, it's readily obvious that this ridge continues at the upper part of the photo, but that it has been largely concealed by Mantik's captions. There is no such ridge, of course, on the Harper fragment. Hmmm...) In any event, let's see some science, Greg. Oh yeah, and while we're at it. Mantik has long claimed his OD measurements show an absence of bone in the shape of the Harper fragment. Apparently, he has now decided to pretend the Harper fragment was but one part of a giant defect on the back of the head. Well, let's see this as well. Point us to an exhibit where Mantik has depicted the size of this supposed giant defect. I mean, it should be easy, right? Mantik visited the archives nine times. He made numerous measurements. It should be no problem, then, for him to present us with views of the skulls in which the large defect is depicted. And what about the lateral x-ray? Mantik has taken to claiming that large sections of the white area at the back of the skull is really missing skull. Why hasn't he marked a version of this x-ray for our education? I, for one, would be curious. Where is it? P.S. Your article is a total disgrace. You take quotes from others and make it look like they came from me. And you respond on Mantik's behalf in such a way that he can deny responsibility for the claims of "Cervantes". It seems, moreover, that you need a reminder. In 2013, Dr. Mantik and I "debated" the Harper fragment at Duquesne University. In that debate, he was forced to admit he was mistaken on a number of claims. Most tellingly, he had to admit that he had great difficulty interpreting the simplest of x-rays, and that I had been correct about the orientation of the Harper fragment in x-ray in comparison to its photos. GB: Science stands on its own merit irrespective of authorship, literary devices employed to express it, and the like. Let's stay on topic by discussing the evidence presented. Here's my "science." Since this thread is about fragments, bones, and injuries to the head this is on topic. I made this - combining the so-called "mystery" photo with the back of the head photo. Note - above link is an animated GIF that repeats; may take a moment to load. From what I researched, bone shatters and bevels outward when an object like a bullet hits it on the opposite side. So I'm seeing beveling in the area that's circled. Am I wrong...or right? Is Speer? Is Mantik? Are you? We can work hard and try to come up with convincing results based on logic, but that's all we can do. And just keep in mind that even so-called experts can be way off, people with a half a dozen degrees hanging on their wall. Witness Baden during the HSCA hearings when he couldn't even orient the mystery photo correctly during his presentation. In my mind, the above GIF, combined with the Z film showing the sudden and rapid backward head movement, demonstrates a shot from the front. Correct me if I'm wrong, but I believe I caught a glimpse in your article that you think the Z film is faked. You do realize that a single 8mm frame is the size of your pinky nail? There's no way they could have faked that film. At the same time, that is the main reason why the film was banned from the public for 12 years - because it *did* show a shot from the front when Kennedy's body is slammed backward onto the seat. So far, Quixote has repeated the same points he has already made. These points have either been previously answered or addressed--but he has failed to address the items put to him in red even once. It is a pattern that is all too familiar: redirect or misdirect, but at all costs avoid. I owe you and your crowd no explanations. If you have trouble reading and thinking that's on you. Still, let me walk you through this one last time. Dr. Mantik has made a series of extraordinary claims over the years. Extraordinary claims demand extraordinary proof. At the heart of his most recent claims is that the Harper Fragment is occipital bone. Such a claim demands that at the bare minimum the Harper Fragment have the appearance of a large piece of occipital bone. But it does not. Not even close. The internal aspect of the occipital bone has a ridge down the middle separating the lobes of the brain. There is no such ridge on the Harper Fragment. Now, if you want to go through life pretending an orange is an apple, or a cat is a dog, you should feel free to do so. But you and your crowd should stop attacking others for failing to share your delusion. 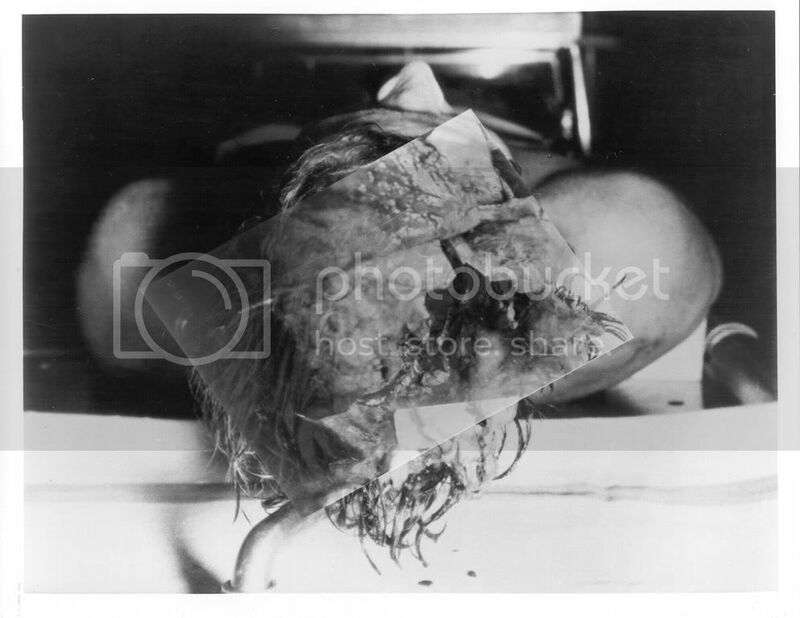 "In a step by step process, I used lead wire to outline on a real human skull where the bone fragments lay on JFK’s skull X-rays. I then took a sequence of X-rays, first using fluoroscopy to obtain the correct orientation, to corroborate their exact locations. Even the mystery photo F8 (taken from the rear) was useful in this process and found to be remarkably consistent with the X-rays. After this I could finally identify a hole near the midline in the occipital area that matched the size and shape of the Harper bone fragment uncannily well. Even more remarkable, though, the lead smudge ended up precisely where the pathologists said the bullet had entered the rear of the skull. " CERVANTES: HF did arise from the upper occipital bone, but the large visible defect (in the occiput) was centered to the right of midline. (See the first and second figures below.) The entire posterior defect consisted not only of HF, but also of missing bone superior to HF, and also the hinged bone fragment immediately to the right of HF—particularly when it swung outward. 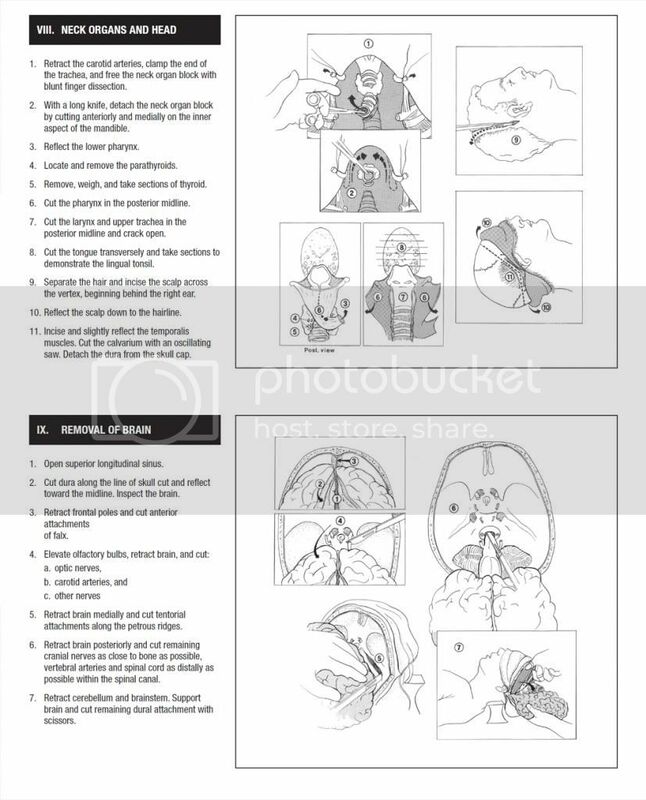 Therefore it is misleading to equate HF to the entire occipital defect. Unfortunately, nearly everyone makes this mistake. Well, the two are mutually exclusive, Greg. 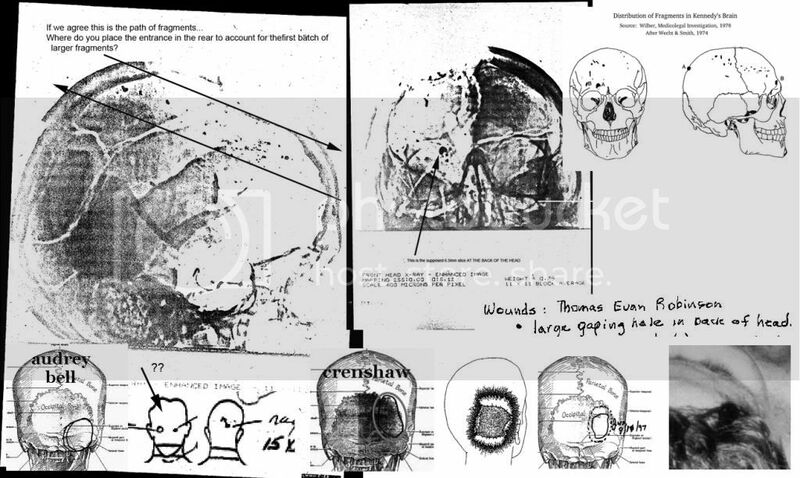 How could there be a hole on the x-rays that "uncannily" matches the size and shape of the Harper fragment if the hole on the back of the head involves missing bone superior to the fragment, and to its right, as Mantik now claims? Was he wrong then or is he wrong now? And if he was wrong then, well, why should we trust him now when his "new" theories are purportedly derived from the measurements he'd taken back then? This is not personal. Please avoid the temptation to make it so. Thoroughly addressing the items in red would go along way to bridge the gap. Refusal to do so is, of course, one's prerogative. However, it could also mean that one hasn't the ability to answer them adequately. With regards to other researcher's work... it is very hard to judge it while putting aside one's own work and conclusions in the process to be truly open minded. I also do not agree with much of what Pat concludes yet you cannot over look the amount of work and effort involved. Myers and Posner worked hard too, doesn't mean I agree and in fact we can find areas in which the truth was stretched to a breaking point. Pat sees things his way and since there usually is not clear cut evidence to the contrary, he MAY be as right as any of us. Yet unless Mantik can be proven to have some ulterior motive, I have to go with the experts who spend their lives in a single area - especially something as difficult as anatomy. What it looks like to you and me is not the same as what an xray expert sees.. and of course there will always be another expert with the opposite view. It is only after Parkland do we get anyone discussing wounds forward of his ears. Ebersole's AARB testimony is very revealing as to how these xrays were created and under who's orders. This brings me to the point I'd like you to consider... during an autopsy and the removal of the scalp - and we get this from the Dr's themselves, all that was necessary was to extend the existing tears and reflect the scalp - the testimony that the brain simply fell out is prime evidence that an autopsy of some sort, a craniotomy, must have either done or was in process prior to 8pm. Without cutting the connections between the brain and the body, as described below, brains don't "fall out"
Humes: To better examine the situation with regard to the skull, at this time, Boswell and I extended the lacerations of the scalp which were at the margins of this wound, down in the direction of both of the President's ears. When extended in this manner and then compared to the image you posted of the cranial hole you can see that the scalp is reflected forward, not to the side, especially if the lacerations were BOTH extended to the ears. I believe you have to move that wound farther back on his head to get the autopsy like lacerations and front folded scalp to make sense. I can't find it this second but am sure it was determined that the fold is almost straight forward over the forehead and eyes. Does that make any different in the way you see it? Indeed Darren, this is just a perfect example of baiting. Greg, everything you do is personal. I'm sorry, David. When one looks at the specimen jar on the left and drainage hole on the right in the "mystery photo" it becomes clear that Mantik's interpretation of the photo, in which the photo was inexplicably taken at some weird angle, is incorrect. The throat wound indicates that something entered or exited it. The exiting body penetrated the shirt, making a pair of holes just below the top button. The holes were tested and it was shown that there were no metal traces left behind. This indicates that the exiting body was not a bullet fragment. A piece of bone is the only other possibility. A bullet or bullet fragment must have hit the bone to make it fragment. It had to have come either from the bullet that made the back wound or a bullet that made a back-of-head wound. There is very little wiggle room in the above conclusions. So which bullet (or fragment thereof) resulted in the bone being fragmented? I don't know of any evidence pointing to the bullet to the back. But there is support for the bullet hitting near the external occipital protuberance. First we have the testimony of Lt. Lipsey (IIRC) who stated that the autopsy doctors were certain that the throat wound was an exit for the bullet hitting near the EOP. (Fragments had apparently deflected off the skull downward.) And second, there was a witness who said he saw bullet fragments making a trail down the neck. I forget who this was, but I believe he was an x-ray technician.